Having some (phpmailer) mail issues today with my site so I though of checking System > System Info > Php Info and it's blank. No info at all. Although there is info on each of the other tabs (PHP Settings, Config File & Directory Permissions). Img included. Tested on different browsers and cleared cache. What would cause this and any suggestions on how to resolve? Possible hack? Everything else on the site seems to be working front end and back. 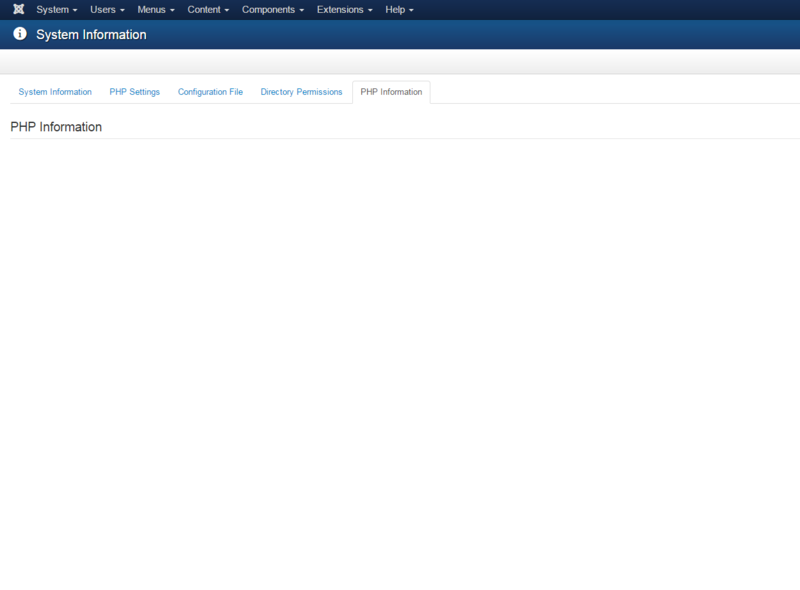 I am able to ftp to the site and view the config.php file which again looks ok to me. Joomla 3.3.0 No recent changes/installations made. Could it be that your server is configured to prevent the view of phpinfo()? Check out your server php.ini to find the line saying disable_functions = phpinfo. There you could remove the phpinfo-entry and try again. So you can alter your php.ini, create a local one or ask your friendly administrator to do this for you. (see here). Not the answer you're looking for? Browse other questions tagged joomla-3.x php global-configuration or ask your own question.